Make sure you are getting the best of both worlds with Maple Manor Premier Park & Stroll. Premier Park and Stroll is rated, on average, 4 out of 5 by 25 Airparks customers. You can find the full reviews on our Maple Manor Premier Park & Stroll reviews page. This unique parking concept allows you to enjoy the best bits of Meet & Greet parking as well as Park & Ride. To check current pricing and availability enter your required parking dates at the top of the page and when you're ready to arrange parking with Maple Manor Premier Park & Stroll you can do so through our easy online booking. You can see our full range of parking on our Heathrow Parking page. Drive to the Premier Inn at Terminal 4 and leave your car in one of the drop-off bays, once you have grabbed your luggage you can check your car in at the parking desk. You can then get on with your holiday while a professional driver parks your car for in a secured car park. Once you have checked your car in you can head through the covered walkway which will have you at Terminal 4 in 7-10 minutes. No need to worry about catching transfer shuttles; just stroll to the airport and get your holiday underway. When you return to the UK head back to the Premier Inn T4 and you'll find your car waiting for you to just hop in and head home. 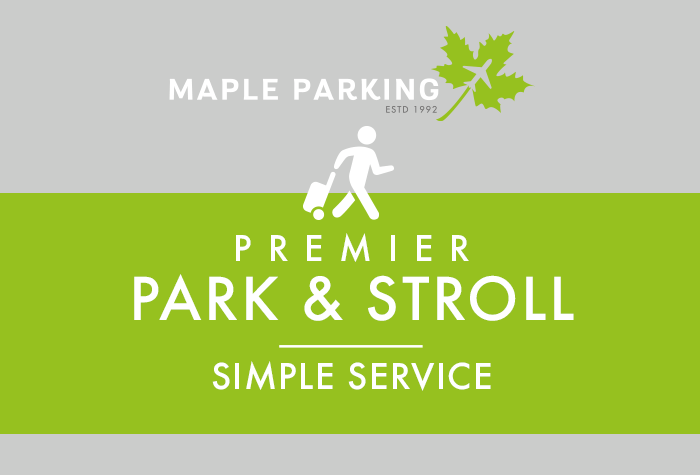 Maple Manor Premier Park & Stroll can only take cars that fit into a standard parking space of 2.4m x 4.8m. It is your responsibility to ensure that your car is legal and safe to drive. If it isn't Maple Manor won't be able to park it and you will not be able to get a refund.